Submitted by Alexander Briones on Jun. 7, 2017. Here we feature the best cool guitar straps for electric and acoustic guitars. We also included top rated strap button adapters and classical guitar straps, to better accommodate different guitar types. 90 out of 100. Incorporating 1000+ ratings and reviews. Fender knows that old school is still cool for many guitarists, and this is why they implement vintage designs in many of their guitars and accessories. Case in point is the Vintage Tweed Guitar Strap, which features the same material and look used on their popular "Tweed" amps. Other than its distinct Fender visual appeal and softer tweed feel, this 2" wide guitar strap is not much different from other standard straps in terms of its mechanical design, offering conventional length adjustment, reliability and stability. Almost all reviewers commend the Fender Vintage Tweed Guitar Strap for its great overall build quality. Since it is straightforward, everything is easy to adjust and works as intended. A lot of users also preferred its soft feel over the harder seatbelt like feel of other guitar straps in the same price range. Finally, there are many who are pleased with the straps elegant appearance, which matches their existing vintage gear. There were a few who complained that the strap button holes were too tight, requiring a bit more effort to setup. Still, this tight connection is something to be thankful about, because the extra time and effort spent is reciprocated with a more secure attachment to your guitar. If you're looking for something affordable, soft and stylish then get the Fender Vintage Tweed Guitar Strap. Steve Vai, Yngwie Malmsteen, Joe Satriani and John Petrucci are just a few of the many professionals who entrust their precious guitars to the DiMarzio Cliplock Guitar Strap system. Its trustworthiness is due to its special quick release "Cliplock" design, which makes switching guitars more convenient without sacrificing stability and reliability. If you're familiar with how Yngwie swings his guitar around his body while performing, then you know that this strap is reliable, if not you can check out some of his older performance videos. Note that initial setup requires you to permanently replace the strap buttons on your guitar with Cliplock ends, which may be daunting to beginners and guitarists who do not want to modify their instruments, but the result is worth it. Cliplock is available in various configurations, and the most popular version features smooth nylon material that is strong enough to handle over 150 lbs of weight, more than enough for the heaviest electric and acoustic guitars, and even bass guitars. Some users describe the Dimarzio Cliplock with superlatives like best and great, but there are those who go so far as saying that it is the King of Straps. And with so many positive recommendations from both artists and users, the market seems to agree. It is well loved for its reliability and convenience, some users even mention using the Cliplock straps for over a decade with no issues. Since the short Cliplock end stays permanently with the guitar, tight fitting cases can be an issue. Get the DiMarzio ClipLock Guitar Strap if you want virtuoso approved professional-grade reliability and convenience. Levy's have built their reputation on the quality of their leather straps, and the M4GF takes their expertise a step further by making the strap wider and more comfortable. 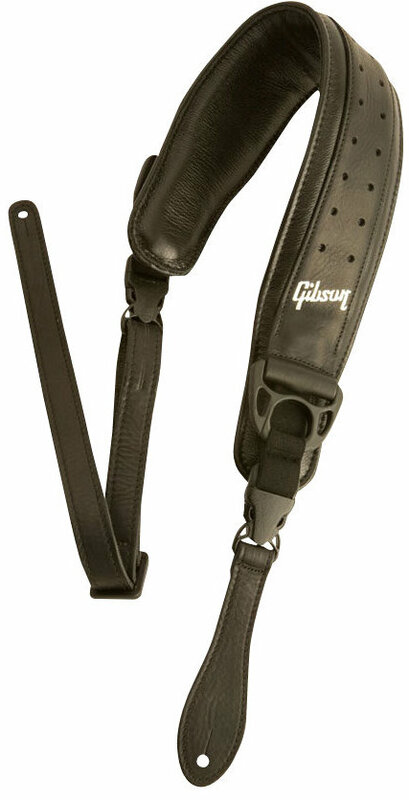 Thanks to its wider 3.5" design, this strap is sturdy enough to handle heavier instruments including bass guitars. The foam padding helps distribute the weight evenly for more comfort, while the suede backing allows for less strap movements and slips. But what really makes this strap standout is the quality of its leather and its elegant appeal that will match most instrument designs. Be it for a Les Paul that weighs over 10 lbs, or for bass guitars that are even heavier, many have been getting great results with the Levy's M4GF strap. A lot of users also commended its easy adjustment design, which doesn't include any hard objects that may accidentally ding their instruments. Finally, a lot of users also found its feel to be nice and soft. There were a few that found the padding and the strap in general to be a bit too soft, goes to show that you can't really please everybody. There were a few users who found the strap to be a bit too wide for their use, but since it is a feature that's clearly specified, it should not be something to complain about. If you play heavy guitars and basses and you're looking for a good looking leather strap then the Levy's Leathers M4GF is highly recommended. Carrying heavy solidbody electric guitars for long periods can be quite the task, thankfully there are comfortable straps like the Gibson Switchblade. This premium strap features 1/2" thick memory foam inner padding that helps distribute the weight evenly as you play your instrument. The full-grain leather top adds to the straps overall appeal while the soft garment leather backing adds to the overall comfort. Finally, the Gibson Switchblade comes with a nylon buckle that serves as a quick-release connector, so you can take off the strap easily. Even with their high expectations, many reviewers still found themselves surprised by the quality of the Gibson Switchblade. Some of the reviews mention using this strap with their Gibson Les Paul guitars to great effect, while others were simply impressed with its overall build quality. Ironically, there were a few who commented that the padding was a bit of an overkill when used with lighter guitars, but they still regarded the strap highly. If comfort is high up in your list of priorities, and budget is not an issue then do check out the Gibson Switchblade. 95 out of 100. Incorporating 30+ ratings and reviews. Iconic guitarists can turn ordinary guitars into something legendary, and it is not just limited to instruments. After John Lennon used the Vox Python Guitar Strap in the mid '60s, it went from being a mere strap, into a sought after accessory and memorabilia. The current production Vox Python strap is a modern recreation of Lennon's original strap, which was auctioned off for around 15 grand. 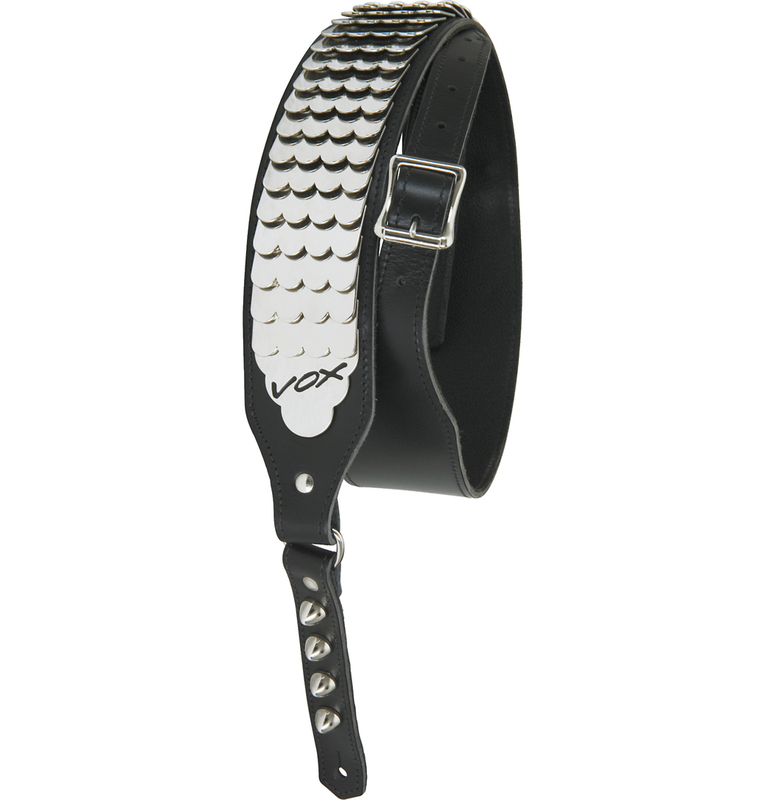 It is 2" wide leather strap with riveted chrome plates that make it visually stand out from regular straps. As expected most of the positive reviews are from John Lennon fans full of nostalgia while wearing the Vox Python Strap. Fans commended it for staying true to the original, with impressive attention to detail. The price tag can be a deterrent for some, but those who have bought it have great things to say about it. The Vox Python Guitar Strap is has enough flash and John Lennon vibe for fans and non-fans alike. 91 out of 100. Incorporating 100+ ratings and reviews. There's no denying Taylor's success in the acoustic guitar market, so it's not surprising that their acoustic guitar straps are also well received. To be specific, the Taylor Suede is the current market favorite when it comes to suede straps, with honey finish being the most popular one. And this is attributed to how the company applies the same level of attention to detail and build quality to these straps as they would their guitars. It is designed to provide a premium look and broken-in feel that matches their guitars, along with specially cut holes for their distinct strap pins. Another noteworthy feature is the lack of plastic parts, which means lesser chances of accidentally scratching your guitar. 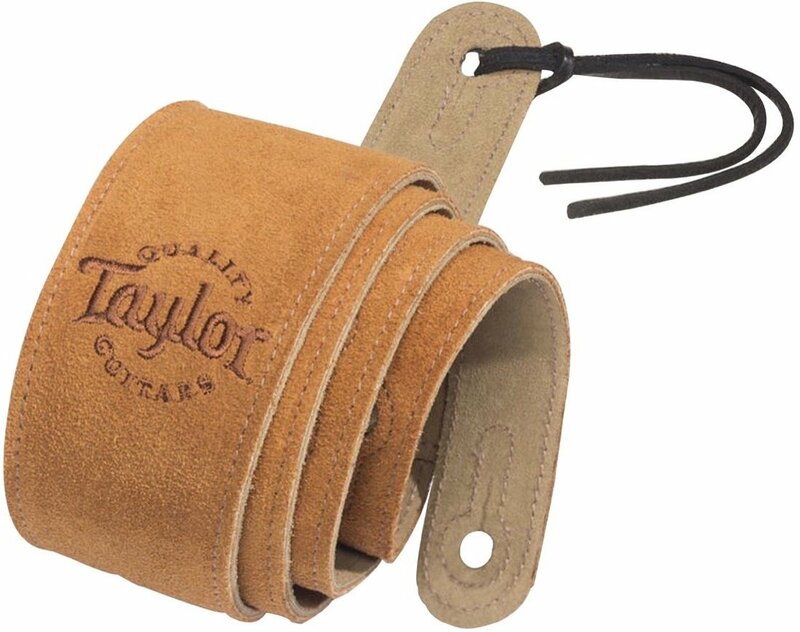 Finally, the strap features the Taylor logo, which many fans of the guitar brand appreciate. The overall response to the Taylor Honey Suede Guitar Strap is overwhelmingly positive, with many commending its great looks and build quality. Many also appreciate the high grip suede material used, which allows for a stable playing position even while moving. It is also nice that there are no rough ends that could scratch your guitar. Interestingly there are some who thought that the Suede's grip is a bit too much. There are also a few who wished for a brand-less version, because they felt the Taylor logo makes it look awkward when used with other guitar brands. The Taylor Honey Suede Guitar Strap is a great strap to own for Taylor acoustic guitar owners, and also other acoustics as well. 91 out of 100. Incorporating 475+ ratings and reviews. 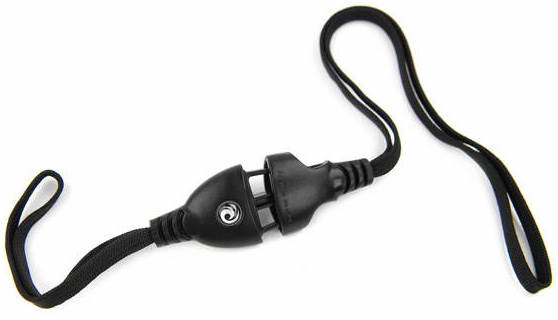 The Planet Waves DGS15 is a guitar strap adapter for use with acoustic guitars that have only one strap button. What makes it different from regular string ties is its small quick release buckle connection, with one side looping around the headstock (under the strings beside the nut), and another looping into the strap hole. This configuration allows for quick attachment and detachment of the strap, and lets you use regular straps with acoustic guitars more efficiently. Most users agree that the Planet Waves DGS15 Strap Adapter works as advertised, and does it so well with its practical design and good build quality. It is well loved for the convenience it provides, so much so that some even bought multiple DGS15s for all their guitars. There are a few who warned that the nylon string that ties on the headstock may damage the finish when used without care. There were also some who complained about the length that it adds to their straps, which lowers the position of the guitar relative to the player. If you're looking for a secure and convenient way to strap acoustic guitars with one strap button, then get the Planet Waves DGS15 Strap Adapter. 86 out of 100. Incorporating 350+ ratings and reviews. Fretfunk is a popular strap adapter that slips underneath the strings at the headstock. 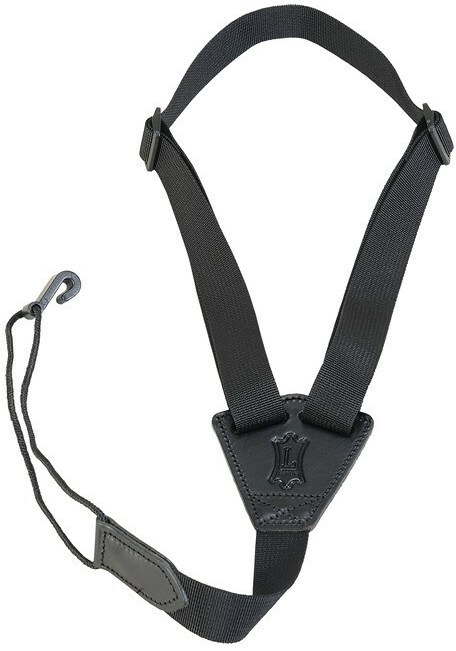 It is locked and secured via a strap button, which also serves as the connecting piece for regular guitar straps. Since it features faux-leather material, it matches the appearance of most guitar straps, and looks much better than regular string ties. The material is also meant to be strong enough to hold the weight of acoustic guitars. Many users found the Fretfunk Strap Adapter to be an affordable tool that allows for a better playing position, be it sitting down or standing up. So much so that some even use it even when their guitars already have two strap buttons. A lot of users also appreciate its overall look, especially when paired with leather straps. There were a few users who had issues with the Strap Button early on, commenting that it was a problem right out of the box. They recommend to check if the button is secured properly into the leather material, before actually using the adapter. If you're looking for a nice looking headstock loop guitar strap adapter, then check out Fretfunk's offerings. 83 out of 100. Incorporating 10+ ratings and reviews. 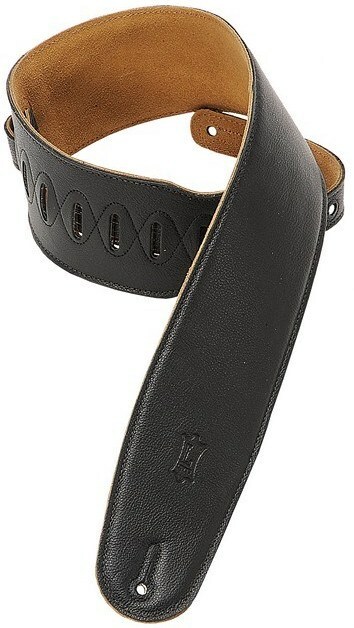 The Levy's Leathers MP23 is a guitar strap with sound hole hook, meant for classical guitars and ukuleles. It features a 1" wide polyester strap, that can go as long as 26" via its tri-glide adjustment design, which should be more than enough for most classical guitars. Note that since it attaches to the soundhole via a plastic hook, it doesn't provide the stability, balance and security of regular guitar straps, but it offers good support for classical guitar players, especially when standing up. The Levy's MP23 strap is available in multiple color and pattern options, so you are bound to find one that matches your taste. Many users commend the Levy's MP23's adjustability and discrete design, which does not interfere with playing. Interestingly, many of the comments are from ukulele players, but there are also classical players who have given their positive responses. There were a few who complained about instrument balance, where the headstock tends to hang lower. Unfortunately this is not a design fault, but a limitation of using straps with soundhole hook. Experienced players expect this limitation, given that it helps position guitars that have no strap buttons. If you're looking for a colorful guitar strap for your traditional classical guitar then the Levy's Leathers MP23 Series is highly recommended. 81 out of 100. Incorporating 50+ ratings and reviews. The Levy's M20 is essentially a longer black version of the M23, with the same discrete plastic sound-hole hook that is meant for guitars with no strap pins, like classical guitars and ukuleles. With its plain black color, this strap is meant for those who want less color, but want the same functionality. The strap is of the same size at 1", and goes through Levy's tri-glide adjustment configuration. Again, you should know that soundhole hook straps can't provide the stability, balance and security that regular guitar straps offer. Still, it offers good support for times when you need to play your classical guitar standing up. The overall response to the Levy's M20 strap is that it works as well as intended. Many commended that the strap and hook feels solid, and that the adjustment provided is enough for most uses. Unfortunately there were some that did not like the tri-glade adjustment system, prompting them to rate lower. There were also some Ukulele players who aired their concern that while it does work nice with classical guitars, it can be a pain to setup for their smaller instrument. Even with its limitations, the M20 is still a good buy for guitars with no strap buttons. Guitars with two strap buttons work with standard guitar straps. They are the easiest to work with and provide the most stable, reliable and convenient way of strapping on your instrument. Guitars with one strap button require strings that can be used to tie the strap to the headstock. To work, one end of the string is tied securely on the strap hole, while the other side is wrapped around the headstock, under the guitar strings beside the nut. Note that if the strap you prefer is not bundled with a string tie, or you prefer a string in different color, you can get your preferred shoe lace and use them as ties - just make sure that they are not using rough materials that can damage the finish of your guitar. Strap Button Adapters are specialized alternatives to string ties, used to allow regular straps to securely attach to the headstock. They basically make any regular guitar strap compatible with one strap button instruments, and do so with extra visual flair and features. Guitars without strap buttons are harder to strap because they require you to drill at least one strap button into the body. Thankfully, there are specialized Classical Guitar Straps that utilize a soundhole hook to help keep your guitar in position. These straps wrap around the waist of the guitar body, and hooks on the bottom of the soundhole. Note they are not as stable as regular straps, so make sure that one hand is always holding the guitar. Straps come with different lengths and while most are adjustable, you don't want to end up with one that is either too long or too short. The general idea is that longer straps are for taller players, or for hose who prefer their guitars positioned lower. Shorter straps allow for higher positions and are meant for younger or shorter players. Wider straps spread the weight of the instrument better, which improves comfort and stability. This is especially useful when carrying heavy guitars and basses. However, there are some players who find wide straps to be distracting and limiting, so it's not always the case that wider is better. 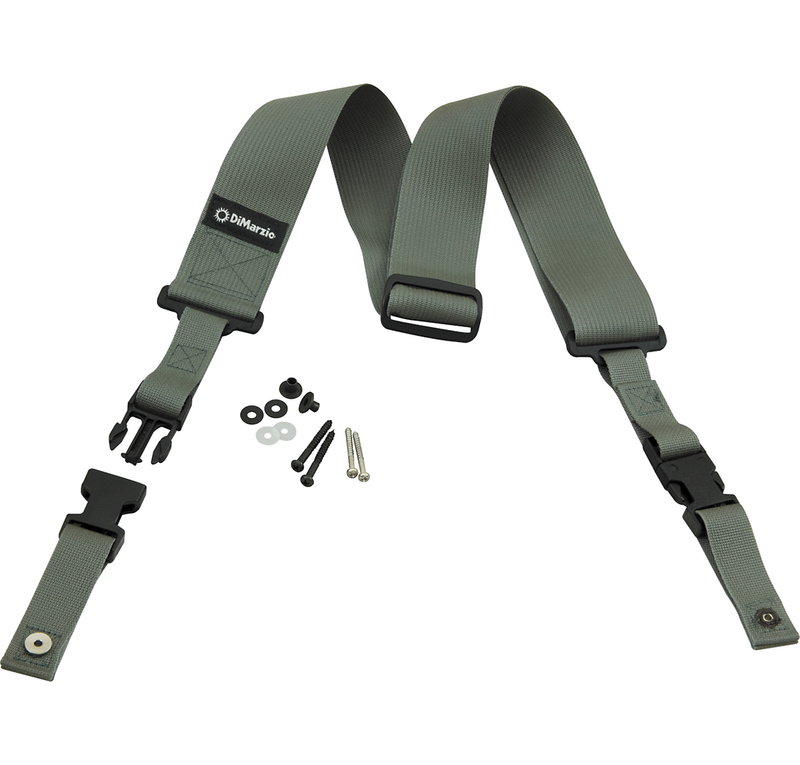 Most affordable straps feature Nylon material because of its strength and affordability. Nylon also serves as good canvass for colorful and artistic designs. Leather is another popular material used on guitar straps. Be it faux or genuine, its natural look and comfortable feel have made it the go-to strap for most professionals. Cotton and fabric are also popular for their comfort, but have the tendency to get dirtied. Other materials often used on straps include memory foam, which are used as pads in some straps, and suede, which many prefer for its smoother look and feel. Straps can inspire you to practice more and play better, so you want your strap to be visually appealing. Be it a strap that matches your favorite instrument, a strap that's commonly used in your preferred musical style, or a reproduction of the strap used by your favorite guitarist, get one that makes you want to pickup your guitar with pride. We first limited our scope to just the popular guitar straps that are widely available in the mainland US. We also looked at guitar strap button adapters and classical guitar straps with sound hole hooks, to accommodate guitars with one or zero strap buttons. We ended up gathering around 5000 ratings and review data, which we then fed into the Gearank Algorithm. This process gave us the scores that we used to narrow down the list and reveal the cream of the crop. Finally, we divided the list according to type and sorted the straps by price from cheapest to most expensive. For more information about this process see How Gearank Works. Submitted by James smithen (not verified) on May. 8, 2018. Submitted by Jason Horton on May. 16, 2018. The ESO Strap didn't make it onto our short-list at the time we published this guide because we didn't find sufficient numbers of independent reviews to rate it properly - maybe that will change by the time we update this guide. Submitted by Chad Little (not verified) on May. 23, 2018.
www.ethosguitarstraps.com if you want premium.